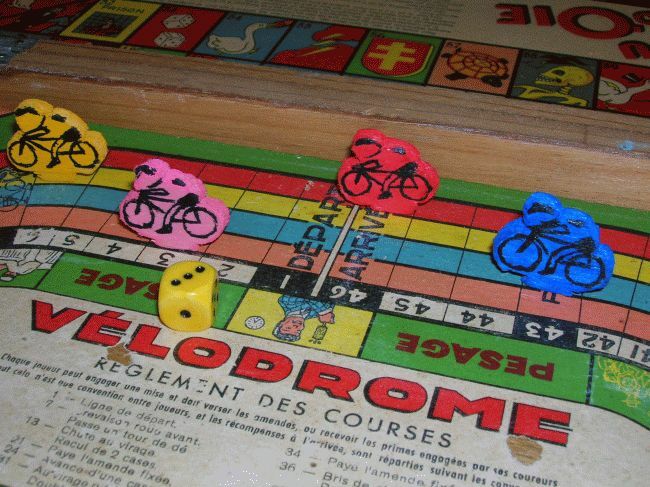 Here is a velodrome game included in a multigame box by GMFR, along with "le jeu de l'oie" el "le jeu des petits chevaux" (the game of goose and ludo). As you can see, there are two versions of this game. 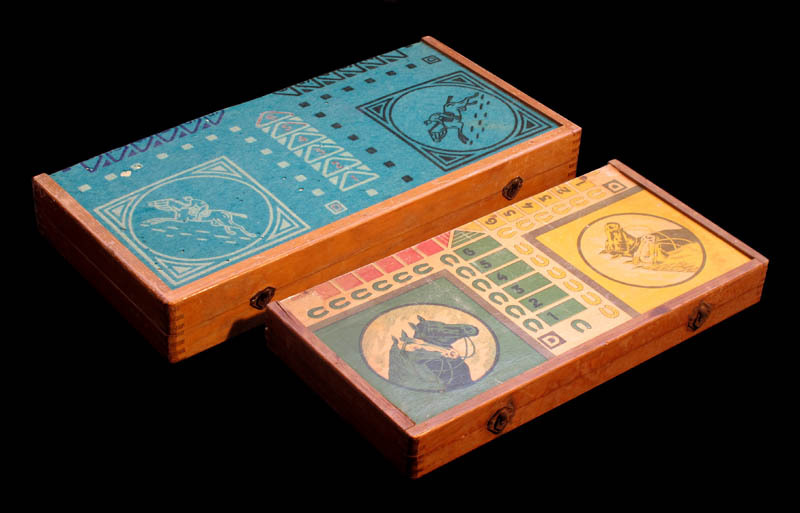 In both cases the box's frame is wooden. 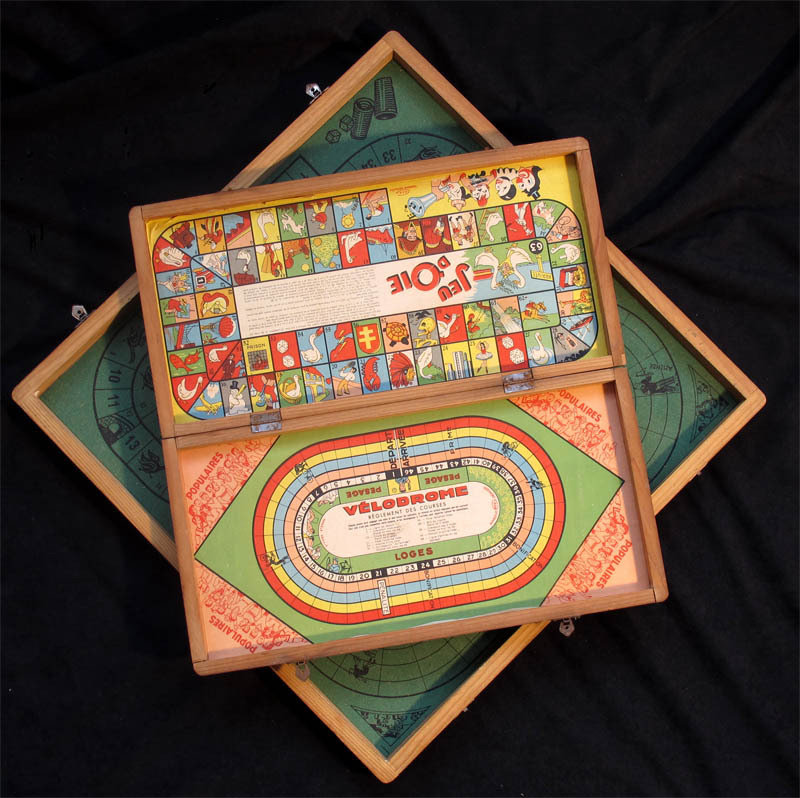 The boards on the smaller multicoloured box are made of cardboard, while those in the bigger box are covered with felt. Thes felt version does not carry the inscription "Modèle Déposé" or the "GMFR mark. By the way, take my dating with a pinch of salt, since I admit not being able to date this one accurately, not even looking at the game of goose's pics. Of course, the rules are simple. These are the rules printed on the cardboard track. Since they are not printed on the felt track, a sheet with the rules was included. 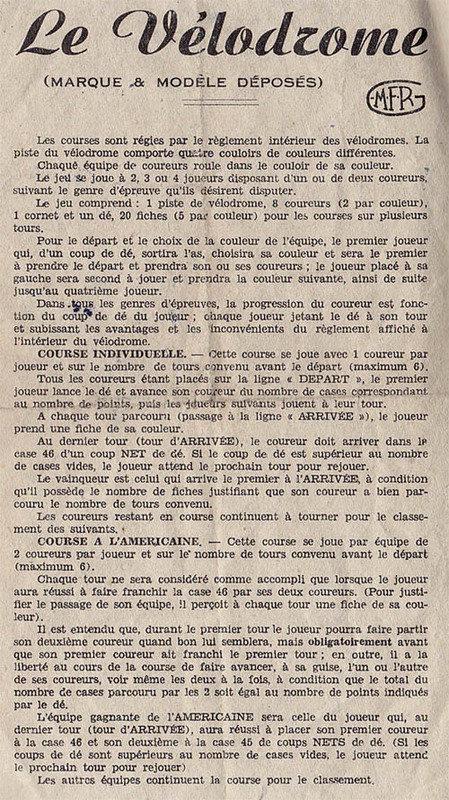 Unfortunately most boxes have lost them (along with some riders, horses and/or counters...) The following rules sheet was found in a green cloth box (thanks to Alain Rebeyrotte for scanning it). However, they mention coloured lanes ("quatre couloirs de couleur differente") andthe directions the rules printed on the track. Since none of these are found on the green cloth board, iIt looks like this sheet was made for a cardboard box. This makes me guess that the carboard box is previous (or at least not later) than the felt one. I have seen several copies of both versions this game (it looks like it was quite common after all), but none of them complete.There are always some riders missing. Between my two boxes, I just have only riders. On the other hand, I have a complete set of coloured wooden sticks, and three different types of "petits chevaux", which is weird since I only have two boxes. 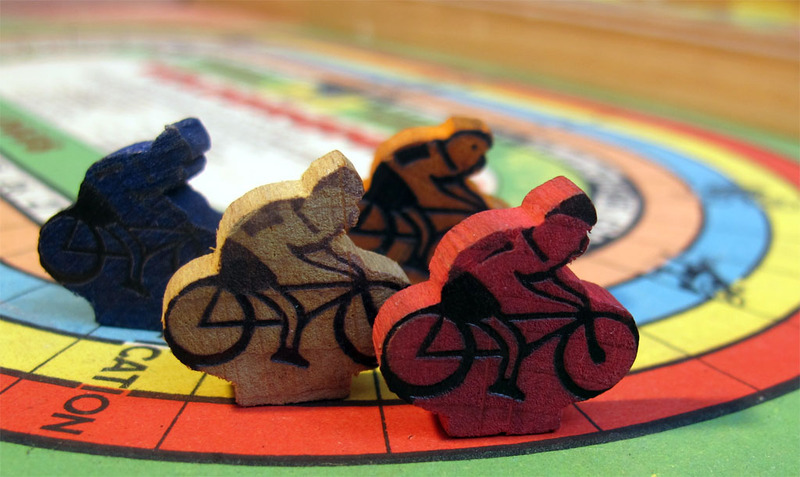 Since the riders are so hard to find, Ludo Nauws has completed his game with some handmade rubber riders . Nice job!. Look at the "jeu des petits chevaux" outside the box.